Enchanté! It's a pleasure to meet you. For Boss #3's first birthday, we decided to have the celebration at home. 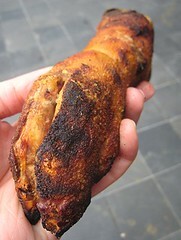 Besides cooking our usual buffet, we also decided to order a Chinese Roast Suckling Pig. Unlike our previous gaffe, we actually managed to procure an excellent one, with help from KN and her dad, Mr. N, who is a master Cantonese chef! Mr. N even offered to come to our house and properly carve up the pig. He had KN's husband, JK, act as an apprentice and they both carved up the roast pig. Thanks, KN, JK and Mr. N! After the carving was done, we decided to set the head and the trotters aside. 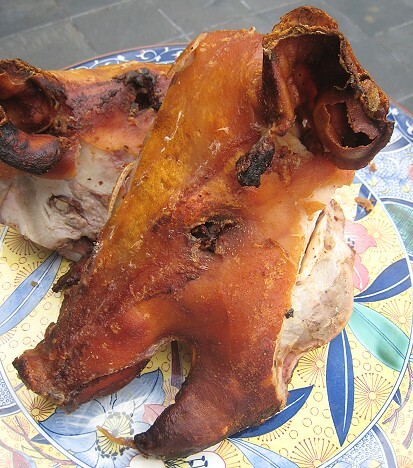 Roast pig heads and leftovers are usually made into paksiw na lechon. This is a stew of pig parts with a sweet-ish, sour-ish sauce thickened with chicken livers. Nowadays, most people just stew it with Mang Tomas sauce. 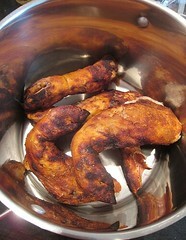 I'm not too fond of paksiw na lechon so we decided to make something different with the pig parts. This post of ours is a double shout-out to Jessica and Lon of FoodMayhem, as we were inspired and guided by not one, but two, of their posts! Thanks, guys! 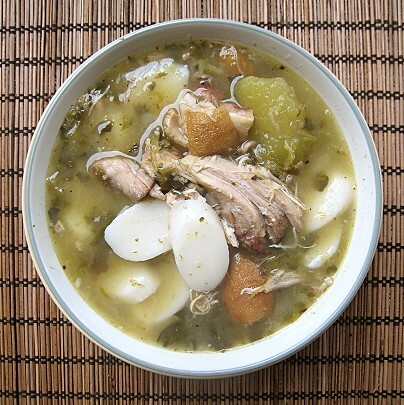 I saw the Quick Duck and Rice Cake Soup post on FoodMayhem about 3 months ago. For reasons unknown, the "essence" of their soup really spoke to me. 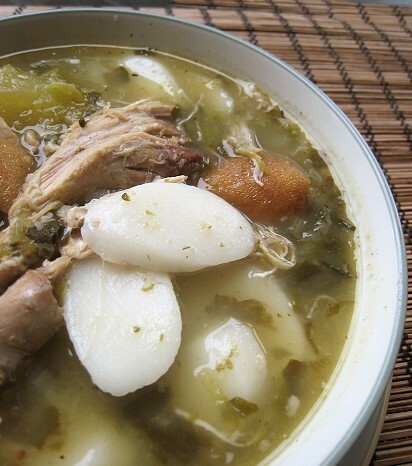 Rich duck, tangy pickled greens and chewy rice cakes all floating around in broth. [dreamy look] I filed it away in my head and waited for the opportunity to make something like it. 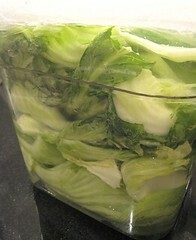 Around the same time, on the first day of December 2008, Jessica and Lon also blogged about Pickled Mustard Greens. Now, this elusive item has... well, eluded JS and I for quite a long time. We would always wish for an extra amount of this when we ate Taiwan Beef Noodle Soup, or when we ate "kwa pao". So, we wasted no time in making a batch. 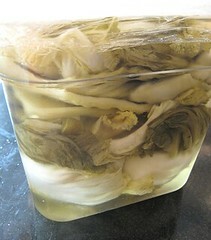 Well, OK, we wasted 16 days before making a batch, starting the pickling process on December 17. But, this sat around in the refrigerator for 3 more months before the right dish called for it. This is very simple to do. Following the instructions on FoodMayhem, we simply washed the mustard greens, then started layering the leaves with salt. We added water to cover, then a splash of vinegar. That's it! We just knew that the suan cai would complement the smoky unctuousness of the roasted pig trotters so perfectly that we were practically skipping as we started this soup! This soup once again utilizes our favorite dump-everything-into-the-pot method. That there are four pig trotters, our whole container of pickled mustard greens that I sliced up (totalling one head of mustard greens) and one big cucumber, just because it had been lying around in the kitchen for a while. Add water to cover. Bring to a boil then lower the heat to simmer. Now walk away! We waited for about three hours or so. It seems like such a weird craving to have, but I was really super-excited to finally eat rice cakes! I've only ever had them once before at a Shanghainese restaurant. When JS suggested that we should leave rice cakes out, I wouldn't hear of it! The rice cakes in their uncooked form were really hard. I was a little skeptical when the instructions called for only a couple miunutes of cooking. But of course, that was the correct amount of time. I threw in the whole bag to the soup at the last moment. The soup was delicious. 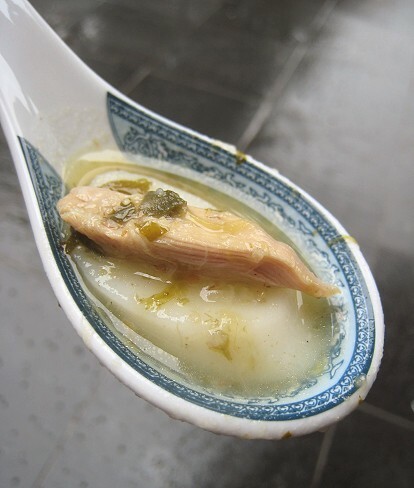 The broth was rich and thick, from the gelatin in the pig's feet, which makes the acidity from the pickled greens much, much welcome. The rice cakes are bland (as they should be) and have a wonderfully springy chew. The underlying hint of smoke adds another flavour dimension. The pig head and feet still had quite a lot of meat in them so this is a soup that is definitely filling. I am not too crazy about pig skin that has been made wet, but sometimes, the chewy texture is also surprisingly enjoyable. I didn't actually need the pork meat in this case. It already gave its all to the broth as far as I was concerned. That broth! The suan cai cut the richness of the pork while at the same time, the richness of the pork mellowed the tang of the pickled greens. 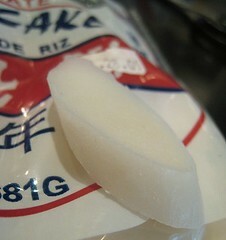 And, those chewy rice cakes are just fun to eat. Was this soup all that I dreamt it would be? If you'd like to participate, see who's hosting next week. WHB is hosted this week by Chriesi of Almond Corner. Wow, that is quite a soup! thanks for the shoutout. and now I must find a way to get some pig trotters! 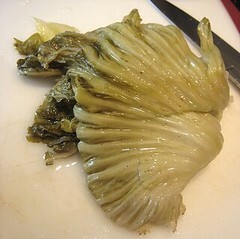 I love greens...so, I'd love the try this. This looks wonderful. I love to see these cuts that I'm not so familiar with getting used - it's really inspirational. We are so honored to have inspired you. The soup looks fantastic. That last pic of the spoonful has me salivating! Especially like the idea of pickled vegetables in a soup,that is a must try for me. 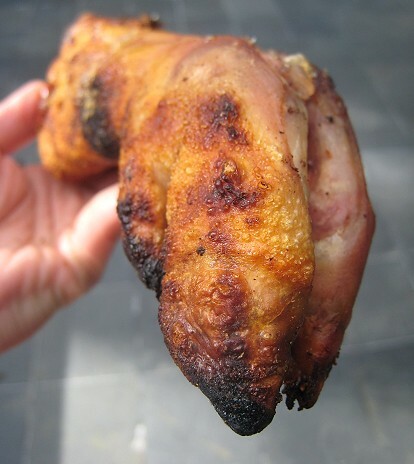 For already-roasted ones, a Chinese BBQ place should do the trick. We haven't tried cooking them from scratch yet. Hmmm... that's an idea. The pickled greens can go over anything you wish! 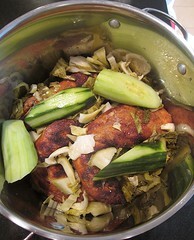 The pickled greens were essential to cut the richness of the trotter broth. Nicely done, you've got my stomach rumbling. I tell you, I was dreaming about that soup of yours for the longest time! 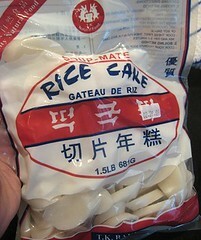 =D I love me some rice cakes, definitely. awww my... that's one of my favourite dish!!! I like to use the pickle mustard as well. I usually stored 2 types of pickled mustard. Of course, I have the usual version without the rice cake but I will try adding it next time. 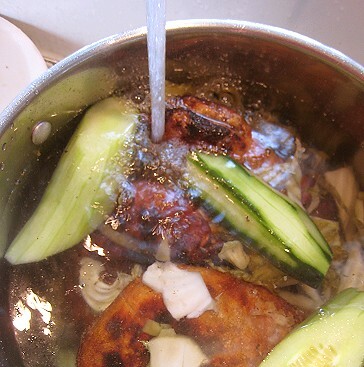 I also love pickled mustard with duck and left overs from roasted duck/chicken, Sio Bak (Roast Pig) and vegetables. SUch dish is alway a welcome after long Chinese New Year... and I love cooking this in cold days with crushed peppercorns and few nutmegs...yummmm..